Identify and discuss FOUR areas of subjective judgement in BEP’s financial statements for 2008. As part of your discussion, you should highlight any changes that you would recommend to ensure that the final statements are in accordance with the IASB’s Conceptual Framework and present a “true and fair” view as required by the Companies Act 2006 and GAAP. The Internal Accounting Standards Board (IASB) prescribes the treatment of intangible assets acquired in business in International Accounting Standard 38 (IAS 38) – Intangible Assets. According to IAS 38, an intangible asset once recognized and acquired subject to the criteria that has a definite useful life and its cost has been measured reliably and the expected future economic benefits will flow to the entity. In the BEP’s case, although it has complied with requirements of IAS-38 in terms of recognition of its licenses and copyrights, however, in case of Harry Boulder license amounting to £ 80,000 and in case of KFun/Tara Productions copyrights’ no amortisation has been charged. An amortisation is required to be charged to the carrying amount reported in the balance sheet as soon as the intangible asset is available to be used or benefits are being derived from it. According to International Accounting Standards 2 (IAS 2) – Inventories; whereby it stipulates that inventories must be reported at lower of its cost or net realizable value. However, in the BEP’s case inventories are stated at only on historical cost. Since, the author from whom the license was obtained has retired; the company however holds worth £ 680,000 merchandise stock and also there has been closure of TV transmission on the part of KFun/Tara productions which cast significant doubt about the realizable value of such merchandise stocks. Although John Bowman is confident to sell the stock above market price but there is a need to determine a reliable market value and most probably it will be lower than the cost. Accordingly, BEP should write off its inventories by directly debiting the loss in cost of goods sold and crediting the carrying amount of inventories. The Prudence concept as prescribed in International Accounting Standard 1 (IAS 1) – Presentation of Financial Statements, clearly states that while preparing financial statements a degree of caution is required such that assets or income are never overstated and liabilities and expenses should never be understated. Accordingly, in case of BEP, the company has booked trade receivables on credit sales without making any provision for doubtful debts. There can be possibility say for instance 5-10% of its trade debts go unpaid. Further, as mentioned in the case, there is also an issue regarding a complaint from the customer amounting to £ 123,000 who is reluctant to settle his dues on account of defective quality of toy. The company however is testing the products. Regardless of the results of the tests a provision is required to be made and if tests prove defective quality, the company should write of its trade debts by £ 123,000 immediately. As far as accidental payment on the part of customer is concerned who subsequently told BEP to keep the payment as deposit for next order. The company however has debited its bank account without passing the corresponding credit entry. Therefore, BEP should book it as unearned revenue or as an advance from the customer in its current liabilities because unless or until the sale has to be made to this customer sometime in future when the merchandises have been despatched and all the risks and rewards have been transferred to the buyer in accordance with IAS 18 – Revenues. Prepare the Statement of Cash Flows for BEP for 2008. Use the information provided in the case study information only. 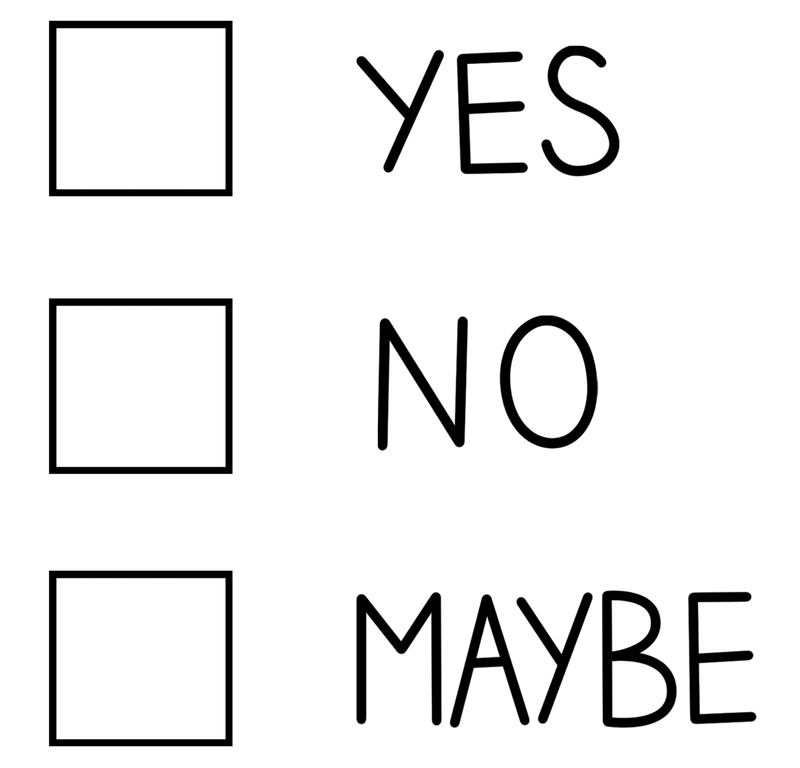 Do NOT incorporate any amendments you might recommend in your answer to Question 1. Critically evaluate the trends in BEP’s sales, costs, overheads and profitability during 2008 relative to 2007, using your analysis to discuss any issues you believe BEP’s Board should address or investigate in the light of the company’s present circumstances and the trading outlook for 2009. 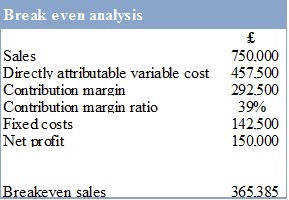 The above table shows the summary of the profitability of the BEP during the year 2007-2008. It is evident from the above figures that there has been 28% growth in the revenue. This growth is due to 11% increase in the sales of Harry Boulder licensed merchandise and major increase of 44% contributed by other character deals and 27% by Kfun character ranges. However the gross profit margin ratio which is calculated by dividing the gross profit with revenue has reduced by 3% (2007: 42%). This was due to the fact that there has been 34% increase in the cost of sales in the current year. The increase in cost of sales by 34% is contributed by 44% increase in payments of royalties to Harry Boulder for holding license of the ideas used in the BEPs merchandise and 31% increase in the prices of raw materials being purchased from supplier due to current inflation in the economies all over the world and 39% increase in the import and distribution costs. The 44% increase in the cost of royalties is due to increment in the rate of royalty percentage because of amendment in the agreement between Harry Boulder and BEP which was effective in the current year by 3% of sales in contrast to 1% in the previous year. The increase in percentage is due to stringent prevailing market conditions and for other brands that were beyond BEP’s financial outreach. BEP’s profitability had also been impacted by a deal made by Sport Events International (SEI) who had initially promised to buy the merchandise procured from China at £ 750,000 which would profit the company by £ 150,000 but eventually SEI could only able to sell 30% of the stock merchandise amounting to £ 225,000 giving a profit of £ 45,000 and after much negotiations agreed to buy the remaining stock for £ 336,000 which was an economical loss for BEP. The use of excessive borrowing on the part of BEP has also harmed profitability because of increase in interest payments disbursed to the bank which have been increased by 103%. The company had also been proposed by Kfun advertising and broadcasting company for full investment in its business but it is uncertain whether it would prove to be a profitable venture or can further erode the company’s overall profitability. 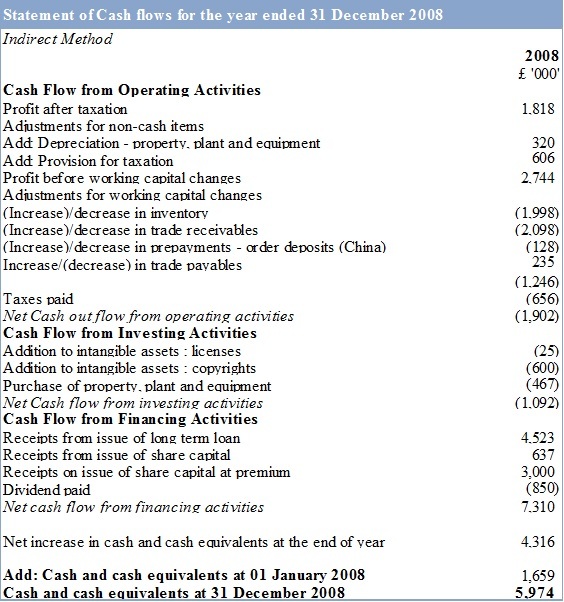 Use the Statement of Cash Flows that you prepared in Question 2, together with an analysis of the operating cash cycle for BEP in 2007 and 2008, to critically discuss whether BEP has any cash flow issues it should address, and recommend solutions for the Board which might improve cash generation in the business. 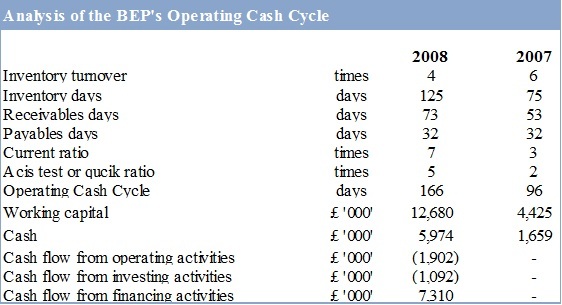 The analysis of BEP’s operating cash cycle is as follows. The above analysis has been performed on the financial statements of BEP for the year ending 31st December 2008. From the above table, we can clearly see that inventory turnover has decreased by two times. As inventory turnover ratio indicates the frequency of replenishment of inventory and indicates the number of times it is sold to customers. Therefore, higher inventory turnover is considered to be a growing factor. However, in BEP case it has been decreased. Accordingly, the inventory days have gone high by 50 days more in the year 2008. This substantial time lag in conversion of inventory to sales is a key business concern for the company and shows inefficiency on the part of its operations management. The company had accumulated extra pile of stocks and thus has not managed to sold them resulting in increase in stock levels. In order to eradicate this issue, the company must need to incorporate efficiency in its operations by reducing the time lag in purchasing the materials and manufacturing of finished goods. Enhance the quality of its merchandise products to create more demand. In addition, BEP can also innovate its products to attract more customers. Furthermore, the receivables day collection period shows how long it takes in the recoveries of BEP’s trade debts towards its customers. The receivables days have been increased by 20 days which clearly indicate that customers are now taking longer time in clearing their outstanding dues. For addressing this issue, a comprehensive credit policy is need to be drafted whereby in order to encourage customers for releasing early payments discounts should be allowed to such customers and surcharge/penalties should be imposed who submit payments after the credit line. There is also a need to ensure credit worthiness of each customer. In contrast, the payable days remained consistent with the previous year. But due to time lag in the inventory and receivables, the operating cash cycle has gone very high by 70 days in the current year leading to 166 days which can significantly harm the operational cash flow. 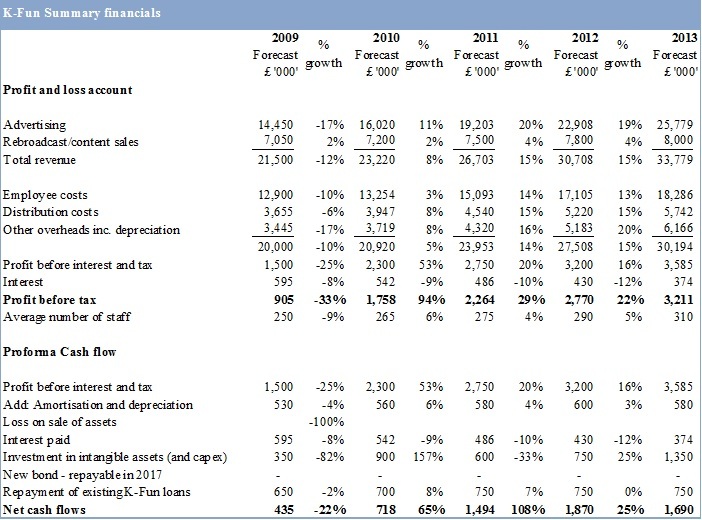 This can be evident from the cash flow from operations which is negative by £ ‘000’ 1,902. The company is poor in generating cash from its operations because of the working capital being accumulated and has increased by £ ‘000’ 8,255 which is twice times as compared to previous year. This poor management of the company’s working capital, the operational cash flows are negative. However, if we look at the total cash at year end, it turned out that it has increased by £ ‘000’ 4,315 as compared to previous year. But this increase is majorly due to cash flow from financing activities because of the receipts from issue of further long term loan by £ ‘000’ 4,523 and receipts from further right issue of share capital by £ ‘000’ 637 and share premium amounting to £ ‘000’ 3,000 out of which £ ‘000’ 850 was paid as dividend to shareholders leading to £ ‘000’ 7,310 cash flow from financing activities. Lastly, the current ratio and the acid test ratio are good and have increased by 4 and 3 times respectively. This is because the company holds excess current assets than its current liabilities and is considered to be a good indicator. For workings please also refer to the attached excel sheet. It will serve the purpose. Use an appropriate costing technique to recommend whether the Board should accept or reject the offer from SEI to purchase the remaining stock. Your answer should explain the rationale behind your recommendation and discuss at least TWO non-financial factors which BEP’s Board should take into account in its final appraisal of the offer. From the above table, we can clearly see that at 30% sale of stock is a loss for the company amounting to £ 39,000 and negative profit margin ratio of 7%. Therefore, this offer should not be considered. In contrast, if SEI had purchased 70% of the stock previously and then agreed to buy the remaining at discounted price it gives more profit than the stock bought at once because of the extra savings due to fixed cost. In the situation under purview as mentioned in the case since BEP procured its products from China which also require a 10% deposit at the time of order and as regards the merchandise of SEI is concerned it had to wait till another slot become available as there is substantial time from designing to finished goods in stores. Therefore, the opportunity cost of the production foregone of BEPs other regular products has not been accounted while accepting the proposal of SEI. Moreover, since the SEI has already tendered breach of deal for buying lesser quantity of stock. It is also not sure whether SEI would buy BEP’s products consistently and frequently in future periods. In addition, both the entities have different motives in terms of the product line as BEP is engaged in the designing and distribution of toys and children games merchandises in contract SEI requires sport goods for major events. Hence, in the light of such scenario, it is not considered advisable to accept the business proposal of SEI because it is not adding value into BEP’s current business. 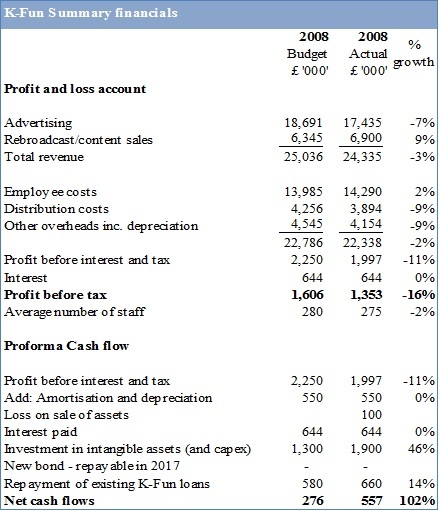 Perform a critical analysis of KFun’s trading results and cash flows in 2008 against its budget for 2008, using your interpretation of the variances as well as other information supplied in the case study to comment on any vulnerabilities in KFun’s profit and cash forecasts for 2009-2013. 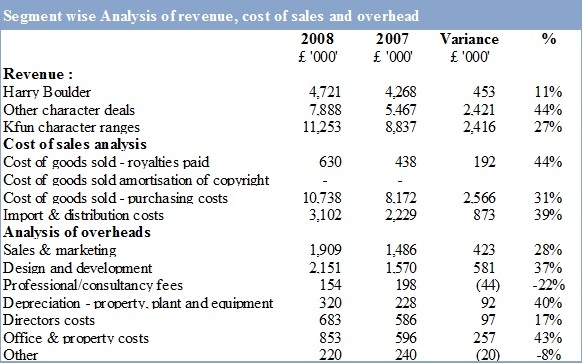 The trading results and cash flows in 2008 against its budget for 2008 are as follows. The results show that actual results are deteriorated as compared to budgets. There has been 7% decrease in revenue from advertising because of the recession caused by global economic crisis in September 2008 which significantly affected all over the world. The rebroadcast/content sales go unexpectedly higher than budget by 9% leading to overall 3% decrease than budgeted figures. The employee costs show an abnormal relation with the average number of staff as in budgeted figures there are more number of staff and less cost of employee while actually the employee were less in number and cost remain high. This can be due to inefficiency among the workers claiming overtime. Surprisingly, the distribution cost and other overhead cost remain less than budgeted by 9% which can be regarded as a positive sign and control over costs leading to cost savings. Since the interest is anticipated before year, therefore, there is no variance in it. The overall profit however has been diminished by 16%. The cash flow turned out to be healthy which shows 102% growth than budgeted. As regard forecasting of future years is concern, the annual average increase in revenue by 17% is not justified keeping in view the current economic situation. It is not feasible if we keep the previous track record of actual versus budgeted of the year 2008 where the advertising actual sales were 7% less than budgeted. 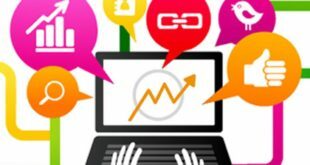 Since advertising is considered to be the discretionary expense of companies and it is most likely to be curtailed during recessionary periods. The rebroadcast/content sales on average of 2-3% are a valid ground because previously it was 9% more than the budgeted. In contract the increase in employee costs in accordance with average number of staff isn’t seem reasonable because in recessionary period usually the entities either resort to lay-offs or redundancies or retain the same employees by enhancing their efficiencies. Furthermore, the significant increase in capital expenditure (CAPEX) on intangible assets is also not consistent with amortisation charge. It shows that either amortisation is not charged on additional CAPEX on intangibles or CAPEX is inaccurately included in the cash flow forecast. However, the net cash flows are growing. For the purpose of evaluating the appraisal of carrying out investment in KFun, we have used the Net Present Value Method as a reliable measure of determining the time value of money. By using this method, we have compared the present values of all cash inflows and outflows using discounting rate of 9% to calculate discounted cash flows. The initial investment includes all the cash held at bank. The summation of discounted cash flows gives net present value amounting to £ 530,000 which clearly indicates that it is a profitable venture. Therefore, it is considered advisable to accept the proposed investment because the company is already overburdened by substantial debt financing (highly geared). 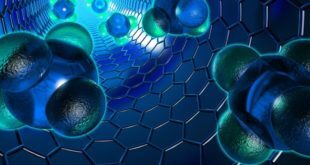 The project is lucrative unless or until the cost of capital stays lower than 12% which is the internal rate of return at which the NPV becomes zero. A critical discussion of the advantages and disadvantages of BEP raising £5m debt or £5m equity to fund an acquisition, including supporting calculations showing the impact of any financing structure on BEP’s liquidity, capital structure and financial risk. 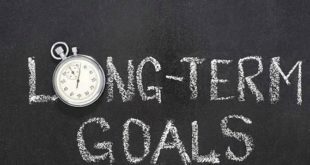 Although both debt and equity financing have different advantages and disadvantages but excessive debt financing is strictly not recommended as it shows that company is relying solely on debt. In contrast equity financing is always beneficial even if it is in excess amounts. It is a healthy sign of any corporate entity. The following tables show the impact on capital structure and on the capital ratios on acquiring of £ 5 million debt or £ 5 million equity shares. 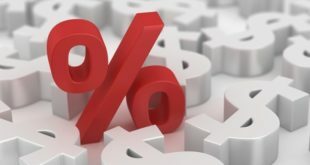 Debt financing can only provide advantage in terms of savings in taxation benefits in form of deduction being allowed against interest expenses. It can also improve relationship with the company’s bank because of return payments in form of principal along with interest charges. In contrast, debt financing has more disadvantages. Above all, the bank takes charge on the company’s assets such as on company’s inventory or trade debts and pledged them as security and can hold the right to recover the amount by selling such assets. Such encumbrances can also make it possible for the bank to intervene over the operational matters of the company casting significant control over its policy matters. Moreover, the highly geared company can never inject more capital because no one is willing to make an investment in it. Equity financing, in general is the most beneficial mode of financing whereby the cost is low as compared to benefits. The company holds a stock in the market and can capitalize market by injection of more capital through continually increasing profitability. Since dividends are paid in both years, it is a good sign of growing business. The only drawback of equity financing is its slow pace in getting the funds as compared to bank loan whereby the funds are swiftly transferred after necessary formal procedures. The capital gearing ratio indicates the company’s structure of the composition of debt with the equity. A high capital gearing is detrimental to the business. At present the company’s capital gearing ratio is 49% which can be reduced to 38% if £ 5 million equity shares are issued. However, it will be deteriorated further to 60% if £ 5 million debt is taken from the bank. It can give rise to financial risk, majorly the company might not be able to meets its current or future debt obligations in form of high interest rates payments along with principal. It will also harm the profitability and in turn the company’s ability to declare and pay dividends which fortunately it is paying in both recent years. Excessive financing can also inhibit additional investment into the company’s business. The interest cover ratio is needed to be high to indicate the number of times the company is able to disburse interest payments. By issuing more debt will weaken the interest cover ratio. Debt to equity ratio of 61% is highly recommendable and is also better than the current state however additional financing is strictly not recommended. A critical discussion of any other factors that you believe should be taken into consideration by the Board in relation to this potential acquisition. Above all, both the entities have different lines of businesses. While BEP is engaged in the design and distribution of toys and children games merchandises but KFun is involved in the broadcasting and advertising business. It will turned out to be a new challenge for BEP to get acquainted with new ways of doing things and entering into new field which it does not acquire the relevant skill or specialized knowledge of running the affairs of the business. Broadcasting companies also have to follow certain laws prescribed by the regulatory authorities and non-compliance with them can result in severe repercussions. 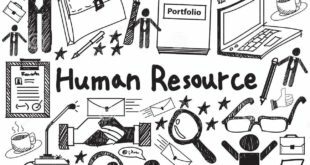 Moreover, since both organizations have diversified workforce. 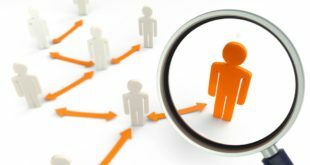 This diversity can cause conflicts among the work peers because of different methods of work style, time keeping and overall culture of both organizations. It required time to adapt with each other.